Description: This article explains in-depth how to move your forum from one hosting provider to another or from one domain name to another. This article explains in-depth how to move your forum from one hosting provider to another (different or same domain) or from one domain to another on the same host. These instructions are only intended to work with MySQL databases. You will need FTP access to your server. You will also need an FTP client. The client which is used during the course of this article is FileZilla. It is highly recommended (although not required) that you have access to phpMyAdmin in order to make a backup of your database. Most hosting providers offer this application. It should be available in the databases section of your hosting control panel (cPanel, Plesk, etc). If you are unsure of how to access phpMyAdmin, you should contact your hosting provider for details. For larger databases (greater than 2MB exactly) you will likely be unable to restore the backed up database via phpMyAdmin. Because of this, you will need to use a program called BigDump to restore the database. BigDump can be obtained from here. Instructions will follow on the proper usage of BigDump. Alternatively, you can use SSH to restore the database (details below). You will need a basic text editor. For Windows: Notepad++. For OS X, use Text Edit. For GNU/Linux, use GEdit or KEdit depending on your desktop environment. You may also choose to use another text editor of your choice. Do not use a word processor such as Microsoft Word or program such as Adobe Dreamweaver. (Optional) If your hosting provider(s) offers SSH (Secure Shell) access to your server, this is the preferred method of backing up and restoring a database. Check with your hosting provider(s) for details. For Windows, you will need an SSH client such as PuTTY. For GNU/Linux and OS X, SSH is built directly into the Terminal. This step will prepare your board for the transfer. Visit your old board’s Administration Control Panel. On the General tab, select the Server settings link on the left-hand side of the page. Ensure Force server URL settings is set to NO, as shown in the image below. Select the Board settings link on the left-hand side of the page. Ensure Disable board is set to YES. Ensure all files and folders have been properly transferred. Select one of the three options below to back up your database. Use whichever one is best based on your needs and what tools you have available to you. Load phpMyAdmin. Depending on how phpMyAdmin is set up on your server, the images shown below will be slightly different. IMPORTANT: If you are using phpMyAdmin 3.4.3.2 or higher, please follow the instructions in this quote box to backup your database. 1. Click the "Export" tab (screenshot). 2. Click the "Custom - display all possible options" radio button. This will display several options. Click your database to highlight it. Select the "Save output to a file" radio button. Give your backup a name, and set compression to None. Under FORMAT, select SQL from the dropdown menu. Under the Format-specific options section, select the radio button next to "structure and data" under Dump table. Under the Data-dump options, make sure the radio button next to "include column names in every INSERT statement" is selected. Finally, click "GO" at the bottom (screenshot). Select your forum’s database from the drop down box in the left-hand frame. In the right-hand frame, select the Export tab. In the Export section of this page, be sure to choose Select All as well as the SQL radio button. 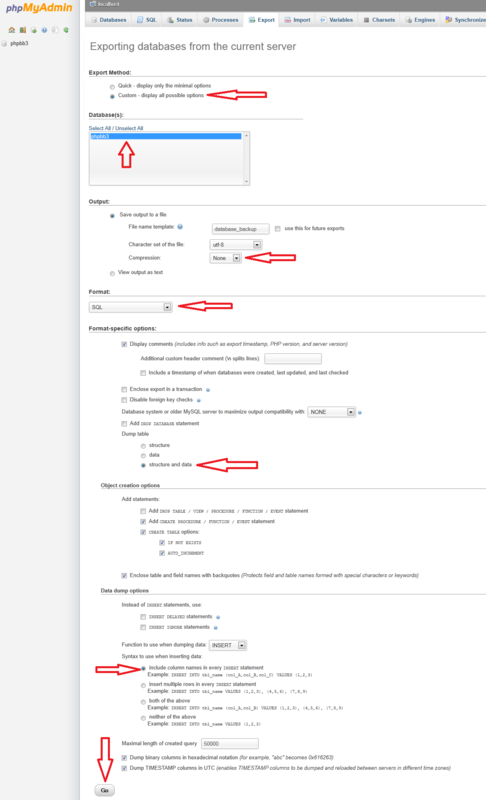 In the Options section of this page, ensure the Add DROP TABLE checkbox is checked. Below this setting in the Data section, ensure Complete inserts is checked, and Extended inserts is unchecked. At the bottom of the page, check the Save as file box. Leave the file name as default and select gzipped as the compression. NOTE: Some hosting providers will not offer gzip as an option. Check with your hosting provider to see if this is offered. However, the majority of providers will have this available. If gzip is not an option, choose None instead. Any other setting not directly mentioned above should be left at its default value. Click Go and save the file to your computer. Proceed to the Restore section. Be sure to substitute USERNAME and PASSWORD with the correct database username/password values. Also be sure to substitute DATABASE_NAME with your newly created database name and NAME_OF_FILE.GZ with the full name of the database backup GZ file. Open an FTP connection to your server and browse to the location where this file is stored. Transfer it to your computer. This option is a good solution for smaller boards with below-average sized databases or for users who do not have access to phpMyAdmin. Visit your old board’s Administration Control Panel. Select the Maintenance Tab. On the left-hand side, click Backup. Ensure all the options are selected as shown in the image below. Be sure to click the Select all button before proceeding with the backup. NOTE: Some hosting providers will not offer gzip as an option. If it is not listed, choose Text instead. Click Submit. Depending on the size of the database and your server's configuration, this will take a few moments to process. You will be presented with a file for download. Save this to your computer. On your new hosting provider/domain, create a new blank database which will contain the transferred forum’s database. Take note of the database name, username, and password. Select one of the three options below to restore your database. Use whichever one is best based on your needs and what tools you have available to you. Load phpMyAdmin on your new hosting provider/domain. Select the new database from the drop down menu on the left-hand side. In the right-hand window, select the Import tab. Browse your computer for the database file. Be sure the Character set is set to utf8. Click Go. Depending on your internet connection, this may take a few moments to load. If all went well, you will be presented with a confirmation message. Proceed to the next step. Extract the contents bigdump.zip file and open bigdump.php in your text editor. Most will leave $db_server at its default value of localhost. However, if your hosting provider has specified a different database server/IP, be sure to change it accordingly. The name of the $db_server will be in your config.php file as $dbhost. If you are unsure, contact your hosting provider to find out. With FileZilla, open an FTP connection to your server. Create a new directory somewhere on your server and name it dump. Set the permissions of this folder to full write. Most often, you will need to right click the file and select File permissions or Properties. Set the permissions to 777, as shown below. Upload both bigdump.php and your database backup file to this directory. Point your browser to the dump/bigdump.php file on your new domain. Follow the on-screen instructions to import the database backup file. Depending on the size of the backup, this will take some time to complete. Please do not close your browser during this process. You will receive a confirmation message when it is complete. After this is complete, delete the dump folder from your server. Proceed with the instructions. Upload the database backup SQL file to a location on your server via FTP. Open an SSH connection to your server and browse to the location where this SQL file is located. Run the following command in SSH to restore the database. Be sure to substitute USERNAME and PASSWORD with the correct database username/password values. Also be sure to substitute DATABASE_NAME with your newly created database name and NAME_OF_FILE with the full name of the database backup SQL/GZ file. Depending on the size of the database backup, this may take a few moments to complete. If there have been no errors, you will be brought back to the prompt. Upload the backed up phpBB files to the location you desire on the new server via FTP. Please note that this step is only necessary if your phBB version on the new host is higher than the version on the old host. 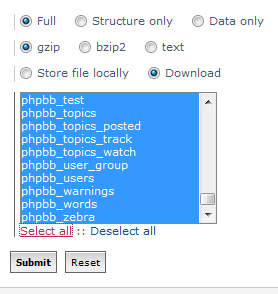 Use FTP to upload the /install folder from the phpBB version you have installed on the new host. Then browse to https://www.your_domain/your_forum_folder/install/database_update.php. When the script is done, delete the /install folder. Please note that this step is only necessary if you have moved to a new domain name. 1263276000 - edited by ric323 to note FTP should use binary mode for files with no extension.